Her construction started in 2nd of February 1911 and finished in 5th of February 1913 in Cherbourg dockyards. Her captain was LV FABRE. The submarine's name was given after the French physics Edmée MARIOTTE who born in Dijon in 1620. He was one of the founders of the experimental physic in France. He has theories about the compression of the gasses. He died in Paris in 12th of May 1684. 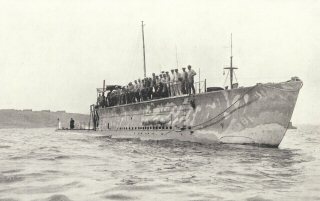 After she has been strucked to the submarine nets in Dardanelles in 27th of July 1915, she has been sunked by the shells from Turkish shore battery in Cimenlik castle. All of the crew has been rescued and kept heldive until the end of the war. Her loss was announced in the official newspaper of France in 5th of december 1919. The wreck has been found right next to a naval base by advanced sonar and side scanning intruments. For long years she has been stayed on ground near Cimenli castle. Later she was scattled and some parts of it has been took its place in the grounding of a pier in the military area. 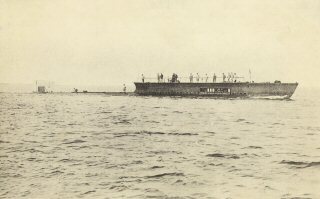 In order to examine the wreck under the pier, the concrete on it has been moved and the wreck found again and military researches has been done on the wreck. Amerika Sefâreti takrîrinde zikrolunan ve Mariotte Tahtelbahiri mürettebâtýndan bulunan Morris Wery nâm þahýsla Dördüncü Wolister Alayý'na mensub T. Walsh nâm Ýngiliz neferinin Afyonkarahisar Üserâ Garnizonluðu'nda bulunduðu lede't-tahkik anlaþýlmýþ olduðu ma‘rûzdur. Ol bâbda emr u fermân hazret-i men lehü'l-emrindir.